Cabinet Refinishing Castle Rock Co.
We guarantee you to give you quality you can trust at affordable Prices. we are a family owned business with over 30 years experience with cabinet painting and cabinet refinishing here in the Denver Metro area. we specialize in painting kitchen cabinets in Denver and all over Colorado. we always make sure absolutely everything is covered from start to finish to protect all areas not being painted. 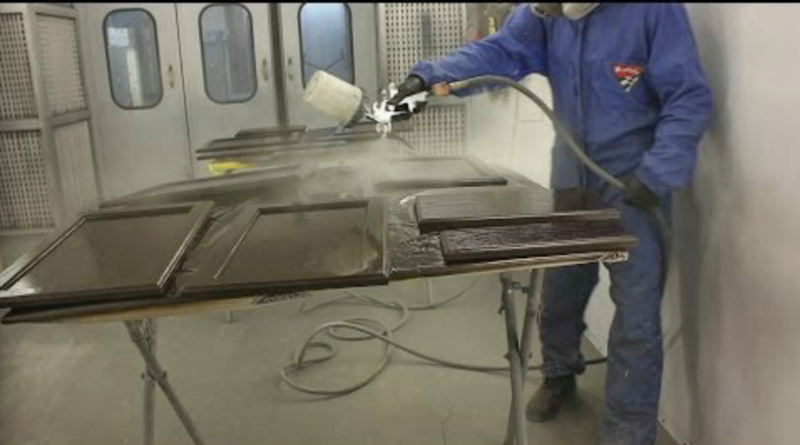 here at Cabinet Refinishing Denver, spraying is a must in order that our customers receive nothing less than a factory finish. we guarantee it. 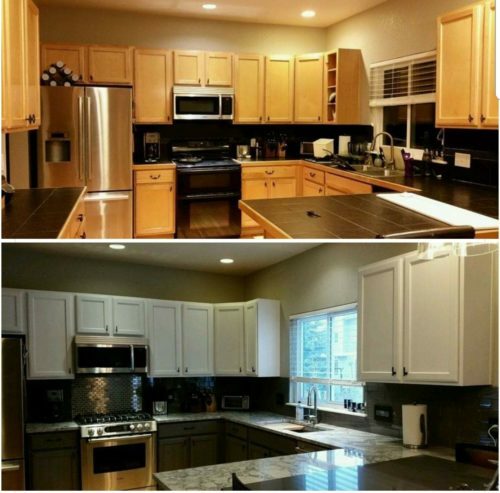 cabinet refinishing Denver, specializes and taking your kitchen cabinets and transforming them from old wood to a factory finish look and with updated hardware makes the job look like a million bucks, saving you thousands of dollars as opposed to replacing or refacing. 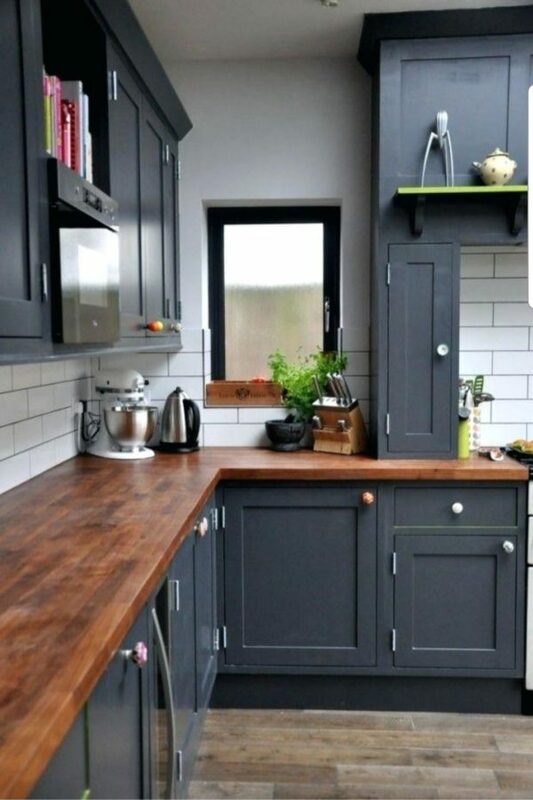 we can take dark wood on kitchen cabinets and refinish them with a bright light which not only makes your cabinets look tremendously beautiful but it also updates and gives the appearance of a much larger kitchen. Give your cabinets a brand new look. Without the expense of a brand new kitchen. 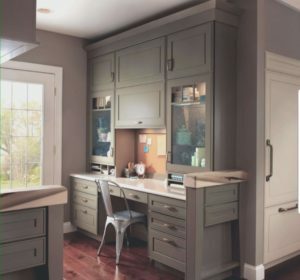 Custom finish your existing cabinetry to virtually any Benjamin Moore or Sherwin williams color and we can match to their colors and we will provide you with a professional, premium quality satin Industrial strength water borne lacquer finish. We service all areas Including, Highlands Ranch CO, Parker Co, centennial Co, Castle Pines Co, Castle Rock Co, and all of Douglas County, Lakewood CO, Littleton Co., Jefferson County, Broomfield, Thornton, Littleton, Arapahoe County, Adams County and all of Denver County, Centennial CO, including Boulder Co, Colorado Springs CO and the entire state of Colorado. Superior Colorado, Louisville Colorado, Frederick Colorado, Longmont Colorado, Loveland Colorado, fort Collins Colorado, Lafayette Colorado, Erie Colorado, and Firestone Colorado. We can come to your home for a design consultation, measure and provide a written quotation. You can see lacquered door samples in various colours to help with your decision. 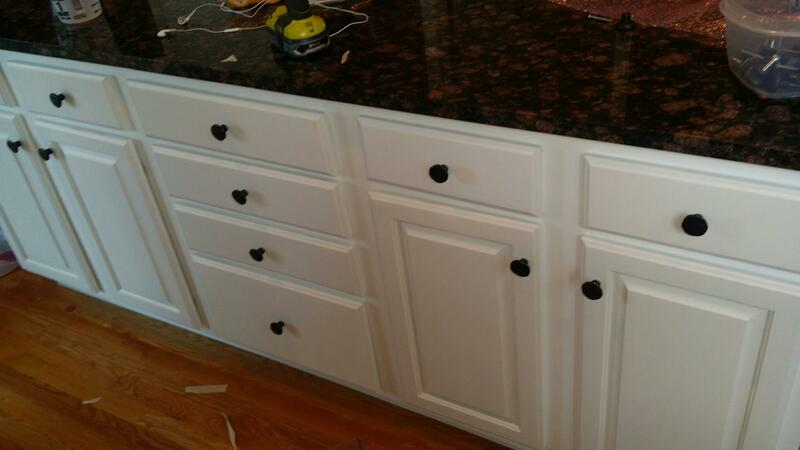 We also can supply countertops and hardware to complete your kitchen renovation. •Doors and drawers will be removed and sprayed off site at our shop. •All fixed flat panel, lower kick plates, crown moulding and trim will be sprayed on site in your home. •The products used will be low VOC and are safe for you and your family. •All onsite areas will be masked off with paper and plastic to protect the surrounding areas. •All surfaces will be cleaned, degreased, sanded and vacuumed. Primed and sanded again. Colour will be sprayed, sand again and spray final coat of colour. Surfaces will be unmasked, inspected, and doors & drawers will be reassembled. •The process takes approximately 14 days from start to finish. On site for 2-4 days based on the size of your kitchen. Cabinet Refinishing Denver is one of the few Denver area paint companies that provide on and off-site cabinet finishing services. We have our very own spray booth for those who want a more “factory finish” look. Typically we will spray the doors and drawers at our Colorado facility and do the face frames and cabinet trim/boxes at your home or place of business. 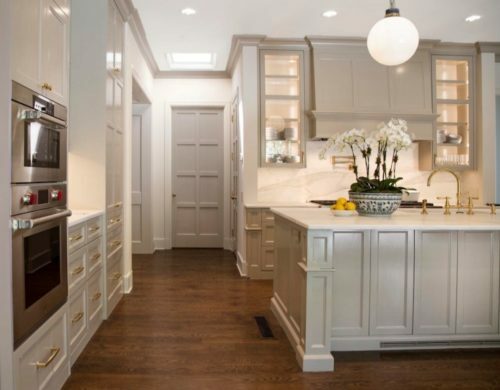 Painting of cabinetry is one of the most difficult and specialty items for a paint contractor. It takes years to master this special art. If not done by someone with experience, the finishes can easily chip or peel off, not adhere well to the surfaces or just plain not look good. Cabinet Refinishing Denver guarantees that your cabinetry and other wood surfaces will be completed according to the highest level of craftsmanship and We always guarantee a factory finish. To see more cabinet refinishing in denver co, tips click on the link below. Here in Denver co. and surrounding areas. We specialize in cabinet painting, cabinet refinishing, cabinet staining and cabinet glazing. If you’re looking to update your cabinets and bring them back to life, then you’ve come to the right place. Cabinet painting and cabinet refinishing is highly technical and requires an experienced cabinet painter to get the job done right. This is also true for cabinet glazing and cabinet staining. Whether you’d like to freshen up or completely transform their color, you can. Here at Cabinet Refinishing Denver we ask most homeowners if they would like cabinet glazing done they are often unsure what it is And keep in mind we service all areas Including, Highlands Ranch CO, Parker Co, centennial Co, Castle Pines Co, Castle Rock Co, and all of Douglas County, Lakewood CO, Littleton Co., Jefferson County, Broomfield, Thornton, Littleton, Arapahoe County, Adams County and all of Denver County, Centennial CO, including Boulder Co, Colorado Springs CO and the entire state of Colorado. Superior Colorado, Louisville Colorado, Frederick Colorado, Longmont Colorado, Loveland Colorado, fort Collins Colorado, Lafayette Colorado, Erie Colorado, and Firestone Colorado. Cabinet glazing is typically used on the cabinets to accentuate the architectural details of the cabinets. Many times, this is done by adding a second color as a pin-stripe in the grooves of the cabinets. You have the option to add a single line of glaze or as many stripes as there are groves on the cabinets. If you’re looking to add a little “something something” to your cabinets then this can really do the trick. Another option of cabinet glazing is having a subtle shade on the front panels of the cabinet door and drawer covers. The glaze is applied to the entire door and drawer cover and then wiped off to give a nice shading effect. This can really add a unique finish and make your cabinets special to you. To glaze or not to glaze, that is the question. If you’re looking for a traditional look then this is a great option. We suggest skipping the cabinet glaze if you are trying to update your cabinets with a more modern look. Our cabinet painters here at Cabinet Refinishing Denver use the best cabinet painting and cabinet refinishing products and processes. The cabinet painters we send to your home are family and will be the very best at their craft. Many contractors offer painting services but we’re the only company to choose for cabinet painting and cabinet refinishing. Your average painting contractor in Denver co. will struggle to deliver the efficiency and factory like finish that we do. The right cabinets for a kitchen or bathroom can mean the difference between a bland space and one that evokes nuance or charm. 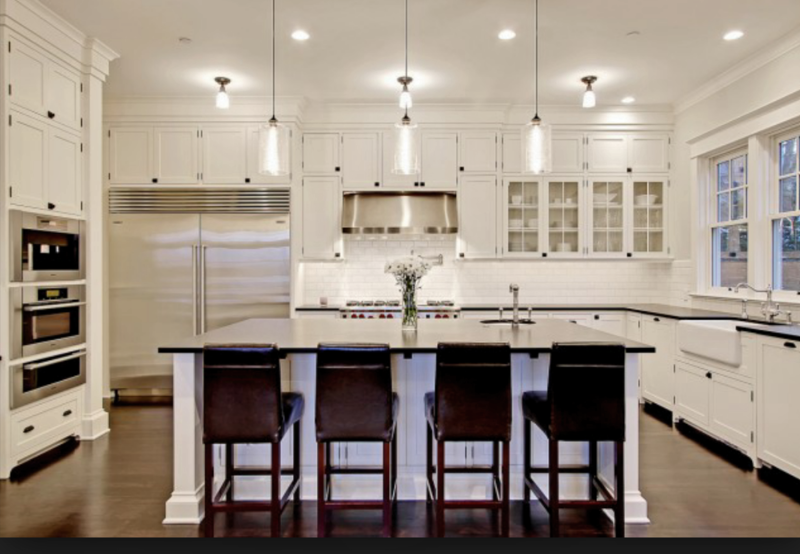 Cabinetry has the ability to create a fresh look if done correctly. 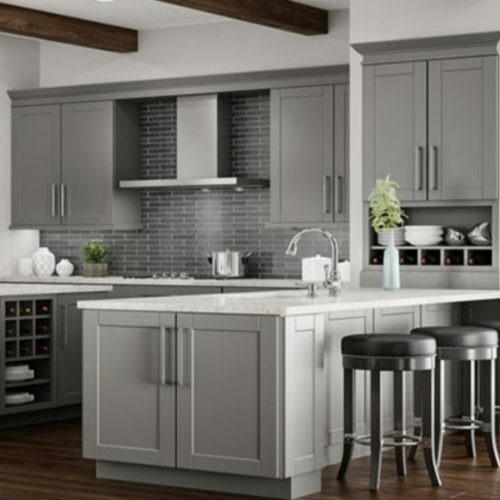 Here at Cabinet Refinishing Denver we know that Cabinet color plays an important role in maintaining a consistent palette and color scheme for kitchens. Cabinets strengthen a primary color or introduce an interesting secondary color. They can be designed to stand out or give more attention to other contrasting elements in the room. Beautiful cabinets stand out in kitchens and bathrooms. They are just as integral to creating an inviting environment or attracting potential buyers as much as countertops and appliances. See for yourself in the before and after time lapse video above of a cabinet painting job we did for a customer. A new color can go a long way to making a room unique. We highly recommend updating the brown cabinets To a color that compliments the surrounding areas of your kitchen surroundings for example, your back splash and your countertops and also your floors. 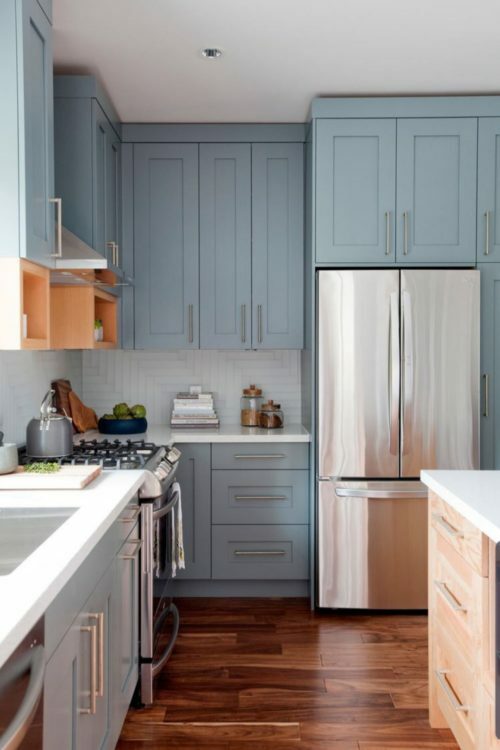 Here at Cabinet Refinishing Denver We give you the options to pick many colors and we can match to just about any color through either Benjamin Moore or Sherwin Williams paint colors. We service all areas of Colorado including, Highlands Ranch CO, Parker Co, centennial Co, Castle Pines Co, Castle Rock Co, and all of Douglas County, Lakewood CO, Littleton Co., Jefferson County, Broomfield, Thornton, Littleton, Arapahoe County, Adams County and all of Denver County, Centennial CO, including Boulder Co, Colorado Springs CO and the entire state of Colorado. Superior Colorado, Louisville Colorado, Frederick Colorado, Longmont Colorado, Loveland Colorado, fort Collins Colorado, Lafayette Colorado, Erie Colorado, and Firestone Colorado. Cabinet replacement is the most expensive option and usually unnecessary. If the cabinet woodwork is in good condition, it isn’t worth completely replacing it. And if you are looking into a kitchen re-model, cabinets can eat up over 40% of your budget. Cabinet refinishing is less expensive and a better alternative than replacement. Usually worth considering if only your cabinet doors are in poor condition. Research the estimated costs first. Particleboard is basically the Wonder Bread of woodwork and only devalue the home. If your cabinets require replacement or refacing, don’t get particleboard. Most of the time, the cabinets themselves are fine and can look transformed just with a new color. Cabinet painting, and cabinet refinishing is the least expensive option and well worth the benefits it provides. Cabinet painting, and cabinet refinishing, is as simple as changing the color from brown to white or another color. New color, maybe knob additions, and it’s good as new — no cabinet replacement or carpentry work required. Minor changes like this can show huge improvement. Check out these befores and afters of a kitchen we have done. Give us a call today and we can get you a free estimate. You can even text as the number of doors and the number of drawers and we can get you an accurate price immediately at 720-219-9716. To see more cabinet refinishing in denver, tips click on the link below. Your kitchen is the center piece of your home and one of the most useful and, consequently, most used rooms in your home. For these reasons, you need to keep your kitchen looking and functioning its best. But it can be hard to keep your kitchen in that kind of condition when its cabinets begin to wear down. Unfortunately, it’s all but inevitable that your kitchen cabinets will reach such a state since you’ll use them so often and cook around them every day, leaving them worn and spattered with food. 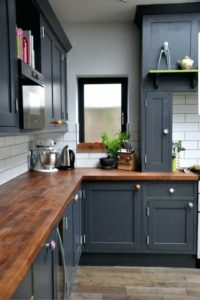 Fortunately, if your kitchen cabinets have worn down to such a point, you can easily get them and your kitchen looking their best once more. For that, just call Cabinet Refinishing Denver for your kitchen cabinet refinishing! If your kitchen cabinets have worn down over the years, the kitchen itself will lose a significant portion of its value as will the value of your home. 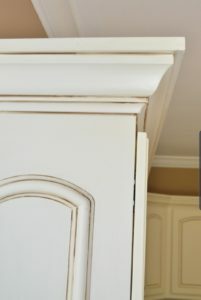 This can be a problem should you want to sell your home and find that outdated cabinets prevent you from commanding the highest price for your home. You might consider replacing those worn-out cabinets as a solution to this problem, but considering how costly that process can be, you might find that the expense cancels out the increased property value you’re after. Instead, call Cabinet Refinishing Denver to get your worn cabinets looking beautiful and new once more. With a kitchen cabinet refinishing, we can help to retain your home’s value at a great cost, providing an unbeatable financial benefit! Cabinet refinishing Has been in our family for many years. My uncle was a cabinet painter. He started training me in wood refinishing back in The early eighties. Since then I’ve seen a lot of changes in the cabinet restoration business. However, I’ve never seen anything quite like this. I am now able to restore kitchen and bath cabinetry in a quarter of the time resulting in a fraction of the cost. It’s simply astounding! Wood and cabinet restoration is my passion. It doesn’t matter if you are restoring your historical home or simply want to refinish your small kitchen or bath. For me it is about the craftmanship in bringing something old back to life. Saving you money is a great perk that comes with my process. We service all of Denver, Colorado including, Highlands Ranch CO, Parker Co, centennial Co, Castle Pines Co, Castle Rock Co, and all of Douglas County, Lakewood CO, Littleton Co., Jefferson County, Broomfield, Thornton, Littleton, Arapahoe County, Adams County and all of Denver County, Centennial CO, including Boulder Co, Colorado Springs CO and the entire state of Colorado. Superior Colorado, Louisville Colorado, Frederick Colorado, Longmont Colorado, Loveland Colorado, fort Collins Colorado, Lafayette Colorado, Erie Colorado, and Firestone Colorado. So Why totally waste good Existing cabinets that have been standing the test of time for decades? Chances are, the older stuff that are presently in your kitchen are of higher quality than a few of the newer and more affordable choices at Home Depot. By reusing these elements that are structurally great, but only need a little facelift, you’re doing things that are great for your home, your checkbook and your surroundings. To see more cabinet Refinishing Denver, tips click on the link below. Custom Cabinet Refinishing is just as the name indicates and Describes the kind of work we do and the high expectations of our customers have for us here at Cabinet Refinishing Denver. We refinish kitchen cabinets , bathroom vanities are primarily our main focus. Kitchen cabinets are often structurally sound but require a face lift after years of use. The kitchen is where the most activity takes place in a home, and of course it’s where the most wear and tear occurs of its surfaces. Replacing or refacing your kitchen cabinets can be quite an expensive project. Refinishing, by comparison, is much more economical, and the return on the investment is quite satisfying And it actually adds value to your home. If you were to ever sell your home and you have updated your kitchen cabinets at least the sale of your home a go much faster as opposed to leaving your cabinets wood. We’ve been in business for over 30 years and the metro Denver area serve in Colorado and all areas including, Highlands Ranch CO, Parker Co, centennial Co, Castle Pines Co, Castle Rock Co, and all of Douglas County, Lakewood CO, Littleton Co., Jefferson County, Broomfield, Thornton, Littleton, Arapahoe County, Adams County and all of Denver County, Centennial CO, including Boulder Co, Colorado Springs CO and the entire state of Colorado. Superior Colorado, Louisville Colorado, Frederick Colorado, Longmont Colorado, Loveland Colorado, fort Collins Colorado, Lafayette Colorado, Erie Colorado, and Firestone Colorado. Cabinet Refinishing Denver uses environmentally friendly water borne finishes which are resistant to water, chemical and common kitchen spills, as well as very flexible and will not crack , chip or peal. The finish is applied by using a high volume, low pressure spray system that allows for more material adhering to the cabinets and less over spray. By using such products we avoid the exposure to toxic solvent particles in the air, which is certainly better for us , our children and our pets. We have been refinishing cabinets for many years without a recall and without a dis-satisfied customer. Along with Custom colors and give you a factory finish which is a guarantee. You can pick your colors to either Benjamin Moore or Sherwin Williams and we can match to their colors and we also paint, glaze and make minor alterations if necessary. It is our goal to make your old kitchen or bathroom cabinets look new without your having to spend a small fortune or get a second mortgage. The money you save with refinishing can buy you a new counter top or floor and give you that new kitchen look without paying for a new kitchen. Cabinets can be very expensive to replace. But why would you spend all that money on new cabinets when you could completely renew your current cabinets for a fraction of the price? This applies to most of the cabinets in your home too! Whether you need your kitchen cabinets, bathroom cabinets, or laundry room cabinets done, the options are endless. Think about it. Your cabinets restored back to their original beauty with a custom color match; or even changed to a completely different color. The choice is yours, but either way, here at Cabinet Refinishing Denver let our experts help make your decision in to a reality. Cabinet Refinishing is a relatively inexpensive way to change up a room. Even with that, at Cabinet Refinishing Denver, our prices are set with you in mind! But the low prices aren’t a reflection of the kind of job we provide. We aim to give you not just full satisfaction but a job well done. 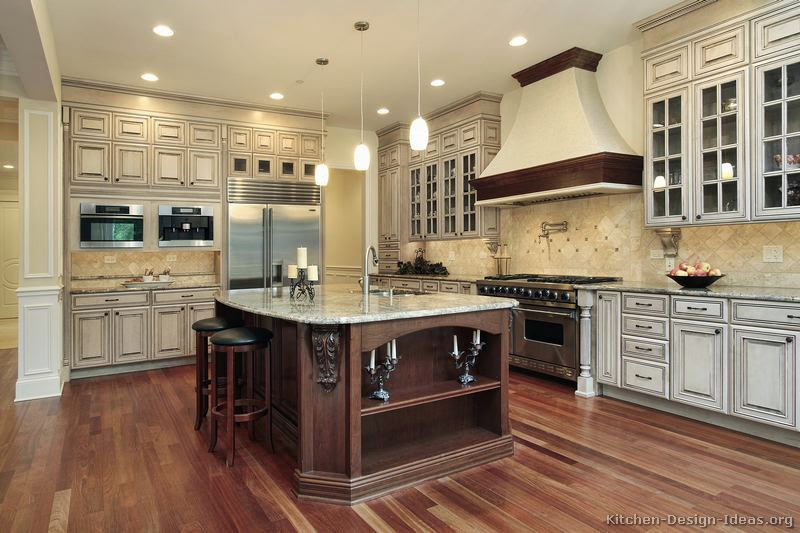 Cabinet Refinishing Denver will give you a job that you can take pride in for years to come. We’ve been in Denver, Colorado doing cabinet refinishing for over 35 years and we also service, Highlands Ranch CO, Parker Co, centennial Co, Castle Pines Co, Castle Rock Co, and all of Douglas County, Lakewood CO, Littleton Co., Jefferson County, Broomfield, Thornton, Littleton, Arapahoe County, Adams County and all of Denver County, Centennial CO, including Boulder Co, Colorado Springs CO and the entire state of Colorado. Superior Colorado, Louisville Colorado, Frederick Colorado, Longmont Colorado, Loveland Colorado, fort Collins Colorado, Lafayette Colorado, Erie Colorado, and Firestone Colorado. Jobs are based on our customer’s needs but there are a number of steps typically involved. As with any job we do, the first step is a thorough cleaning and preparation of the cabinet area. The immediate area around the cabinets is covered to prevent paint from getting anywhere that it doesn’t need to be. Following these steps there’s a mixture of sanding, dusting and priming, and whatever else is needed to ensure that your job is done to exceed the highest of your standards. Getting your cabinets painted can save you lots of money and it can give your kitchen the face lift that it needs to look new again. 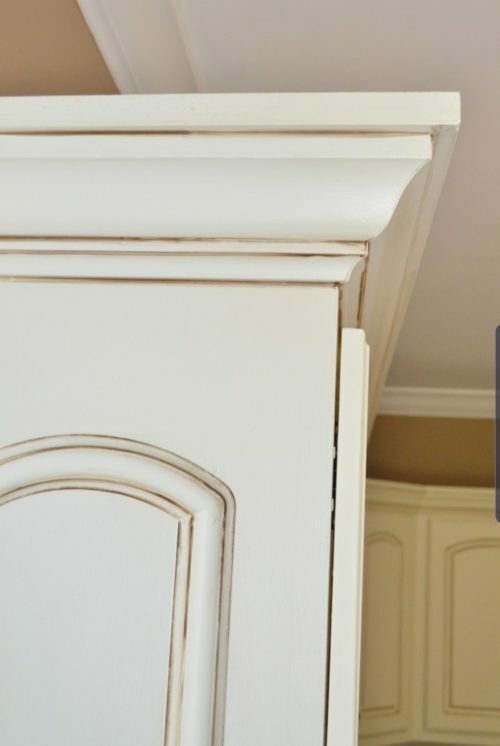 The problem is that painting your cabinets can take a great deal of time, especially when you consider the amount of preparation time it takes to get a professional result. Although cabinet painting can help disguise your cabinets’ imperfections, it in order to get the best results you need to sand your cabinets before you paint them. This will help the paint to bond with your kitchen cabinets so your results will be more durable and last you a lot longer. Also, a professional spayed application is ideal so it looks like a factory finish. There are special cabinet paints that are not commonly found and that only professional cabinet painters in Denver Colorado, may have access to. You don’t have to put in all of that time and energy to do it yourself, turn to the professionals at Straight Edge Painting! 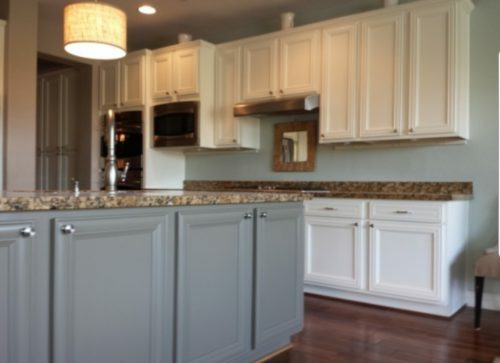 Professionally painted cabinets can make your overly worn kitchen look like new again. You will be surprised at what a difference it can make! If you want to the best results, it is important that you trust your cabinet painting to the best. At Cabinet Refinishing Denver we offer a full range of kitchen cabinet painting services in Denver Colorado, including cabinet Refinishing. We use the latest tools and techniques to give you an outstanding result that you will love for years to come. Contact us today for your free cabinet painting estimate. Our professional cabinet Painters will provide the best cabinet Painting, and cabinet Refinishing, job possible for your cabinets. Allow us to transform your old-fashioned kitchen into a new modern space, and whether you’re updating them for your own enjoyment or to sell your home, we know you will be pleased with the difference. Call us today 720-219-9716 today to get a free estimate. For high quality cabinet painting in Denver, let the team at Cabinet Refinishing Denver assist you today. We are a family owned business With over 35 years of experience that takes pride in providing only the best in customer service and satisfaction, and strives to do the best job for every job. We offer a cabinet refinishing and Painting services, the professionals at Cabinet Refinishing Denver will paint cabinets with expert precision. Our team Is family and we truly care about the quality of work That we produce and are painters that love what we do and will treat your project with the neatness and respect it deserves. Call today to schedule your appointment for a free cabinet color consultation with us, to see if you like what we have to offer! 720-219-9716. At Cabinet Refinishing Denver, we make available a wide range of cabinet painting and Refinishing services, including repainting existing cabinets with a new color, providing new cabinets, removing and reconnecting the cabinet hardware, installing new door stoppers, and offering spray and hand brush options for maximum customization possibilities for our cabinet painting in Denver. We have the experience and expertise to get your cabinets The factory finish you deserve and Whatever your vision is for your cabinets or even your bathroom cabinets, we are happy to work with you to ensure the final product is everything you imagined. We service all areas in Denver, Colorado, including, Highlands Ranch CO, Parker Co, centennial Co, Castle Pines Co, Castle Rock Co, and all of Douglas County, Lakewood CO, Littleton Co., Jefferson County, Broomfield, Thornton, Littleton, Arapahoe County, Adams County and all of Denver County, Centennial CO, including Boulder Co, Colorado Springs CO and the entire state of Colorado. Superior Colorado, Louisville Colorado, Frederick Colorado, Longmont Colorado, Loveland Colorado, fort Collins Colorado, Lafayette Colorado, Erie Colorado, and Firestone Colorado. There are a lot of important steps involved if you want to paint cabinets. At Cabinet Refinishing Denver, we take care to cover all the angles from the beginning of the process to the end. 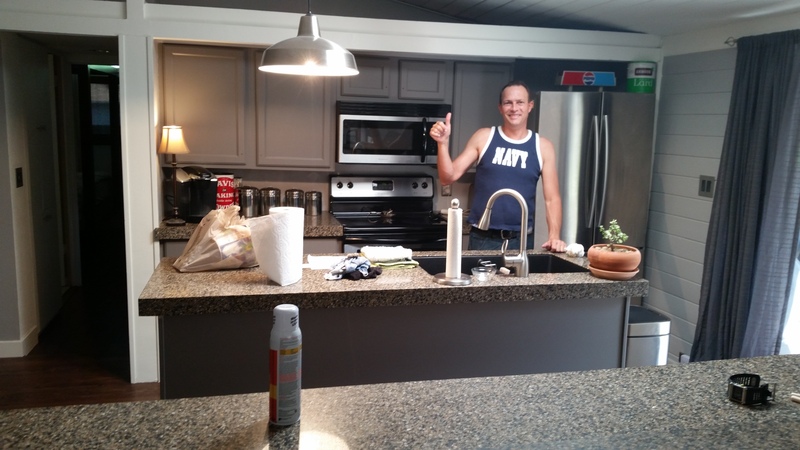 From cleaning and prepping the cabinets to applying the primer and sanding the surfaces, we do it all. All cabinets are caulked around the seams and panels, and given several coats of your preferred color or finish. Once the project is complete, we clean up the area and leave you with nothing to do but sit back and enjoy your new paint cabinets. Thank you for your interest in Cabinet Refinishing Denver, We are a full service painting company that specializes in custom cabinet refinishing and finishing to Any of your kitchen cabinets common or bathroom cabinets. Take a moment to navigate our site and call or email us with your questions regarding any services that we may provide you or if you would like to set up an appointment for a free estimate. We have a centrally located shop, where we spray all of our finishes To all work performed for your current cabinetry. It’s simple! We are a company dedicated to bringing a great experience to our customers in everything we do. This is not just how we earn our living but also how we gauge our ability to make a difference in peoples lives starting with their homes. We are about to embark on our 35 year anniversary in business with 75% of our work force having been with us for the bulk of these 35 years. We realize that our continued success depends on your continued satisfaction. We know that when we leave you with a”great experience” you will have the confidence to refer Cabinet Refinishing Denver to your family and friends. Referrals are the life blood for any growing company. To see more cabinet Refinishing Denver co, tips click on the link below. 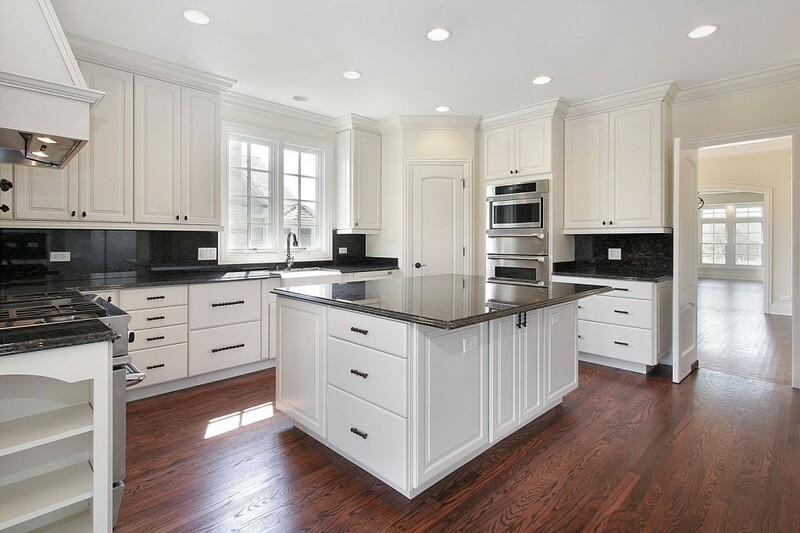 For over 35 years Cabinet Refinishing Denver has served Denver Colorado homeowners with the highest quality cabinet Refinishing and kitchen cabinet Painting services. You may wish to update your kitchen but don’t want to deal with the mess or the expense. Cabinet Refinishing Denver has the answer! Cabinet Refinishing can brighten your kitchen in as little as 3-7 Business days. Did you know that kitchen cabinet Refinishing, is the green alternative to a complete kitchen remodel? Cabinet Refinishing Denver started over 35 years ago with one simple plan, to repair and refinish kitchen cabinets. Our company has expanded to refinishing and repairing kitchens, staircases, pianos, and much more. The goal is to bring back the beauty of wood and continue the craftsmanship of the past and future. Kitchen remodeling and cabinet Refinishing is one main concern of families, Cabinet Refinishing Denver can take care of this concern, you will get a great refinished cabinet in your kitchen And we guarantee a factory finish of any color of your choice, no matter how big or small is, we can take care of it. Making your customize Existing cabinets What they factory finish of any color of your choice is our profession, We make kitchen cabinet, bathroom cabinet, garage cabinet, storage and furniture are part of our skill and turn your concept to reality. We can do All type of woods are available for your cabinet doors like Oak, Cherry, Alder, Walnut, Birch And apply any color of your choice to give it a factory finish as if it just came out of the store. For high quality cabinet refinishing in Denver Colorado we have been cabinet refinishers for over 35 years! 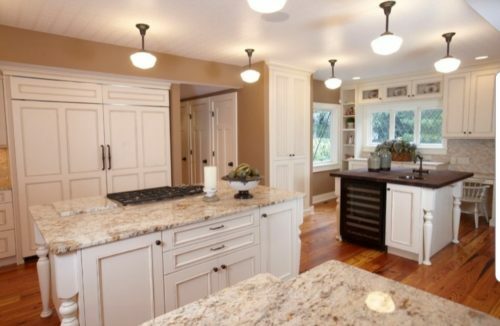 When it comes to refinishing cabinetry in Denver, our skilled craftsmen cabinet Refinishers do the job right, maintaining our commitment to quality and high standards. We at Cabinet Refinishing Denver have the expertise and dependability that you are looking for. We offer the most professional and affordable cabinet painting in Denver Colorado including:Highlands Ranch CO, Parker Co, centennial Co, Castle Pines Co, Castle Rock Co, and all of Douglas County, Lakewood CO, Littleton Co., Jefferson County, Broomfield, Thornton, Littleton, Arapahoe County, Adams County and all of Denver County, Centennial CO, including Boulder Co, Colorado Springs CO and the entire state of Colorado. Superior Colorado, Louisville Colorado, Frederick Colorado, Longmont Colorado, Loveland Colorado, fort Collins Colorado, Lafayette Colorado, Erie Colorado, and Firestone Colorado. Cabinet Refinishing Denver has been painting cabinets, staining cabinets and glazing cabinets in Denver Colorado, For over 35 years using a variety of paint colors, finishes and textures. Our cost-effective cabinet resurfacing in Denver extends the life of your cabinets and saves you money. Don’t buy over-priced new cabinets when Cabinet Refinishing Denver offers competitive pricing for refinishing cabinets in Denver. Let our experienced cabinet painters be your one-stop resource for cabinet painting or cabinet staining. Need a kitchen cabinet makeover in Denver Colorado? Don’t hesitate to call us! Cabinet Refinishing Denver are the leaders in refinishing kitchen cabinets for homeowners. We will refinish kitchen cabinets and fix your aged and cracked cabinet panels so they look like new again. If you want to update your kitchen, Remodeling resurfaces cabinets for a fraction of the cost of new cabinets. We are the best, cabinet repainting company in Colorado to rely on when you’re looking for quality workmanship. We been providing custom cabinet refinishing and Our attention to detail and excellent customer service is what has kept us in business and keeps our customers coming back! You can trust that we are professional cabinet refinishers and are as courteous as they are knowledgeable and that you will be delighted with your updated cabinets. 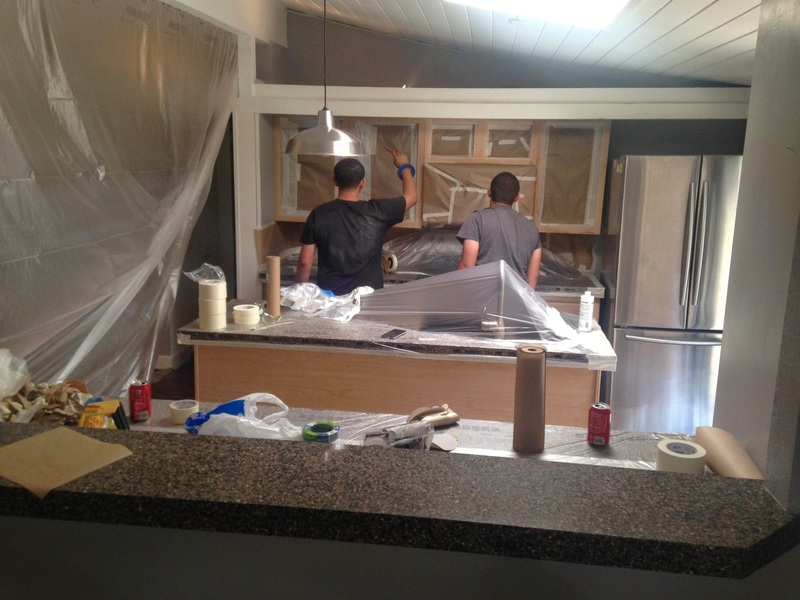 Contact Cabinet Refinishing Denver about your cabinets refinishing project in Denver,. Our cabinet painting crew will be happy to provide you with a competitive quote and stand by the outstanding cabinet refinishing service that we deliver. Call us today 720-219-9716. You can find the best quality and service for your cabinet painting, restoration, and refinishing needs for your kitchen or bathroom cabinets When you go with Cabinet Refinishing Denver, we have many years of experience helping Denver Colorado, homeowners get the look they need for their homes, and you can feel confident that we will bring that same expertise to your home as well. We feel there is no project is too difficult, and you can count on us to make sure that we will treat your project as if it were our own. As a family owned business we’re committed to treating you just like family. One of the most sought after methods of updating your kitchen is to replace the existing cabinets with new ones. Unfortunately, in many cases, this option isn’t always affordable. You can almost definitely save a lot of money and time by simply repainting them instead of getting new cabinets. 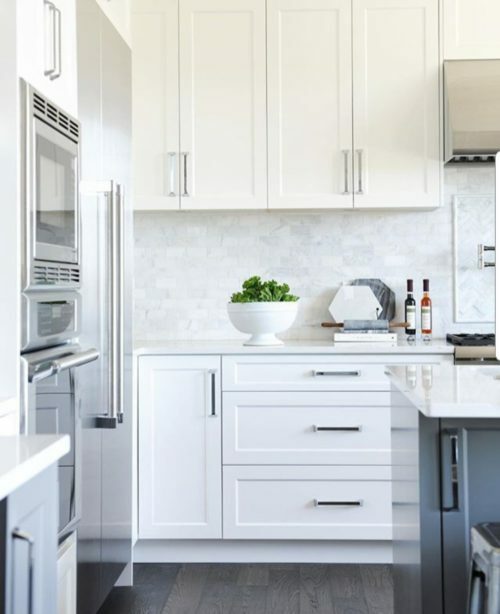 Contrary to what you might have heard, you can get that fresh, remodeled look at a fraction of the price and without the mess and hassle of actually updating your kitchen and bathroom cabinets as part of a complete remodel. If you live in Denver, be sure to contact Cabinet Refinishing Denver for all your cabinet painting needs. Cabinet Refinishing Denver is proud to be a local insured cabinet Painting professionals With over 35 years of experience of cabinet painting and cabinet refinishing to route all of Denver Colorado, including Highlands Ranch CO, Parker Co, centennial Co, Castle Pines Co, Castle Rock Co, and all of Douglas County, Lakewood CO, Littleton Co., Jefferson County, Broomfield, Thornton, Littleton, Arapahoe County, Adams County and all of Denver County, Centennial CO, including Boulder Co, Colorado Springs CO and the entire state of Colorado. Superior Colorado, Louisville Colorado, Frederick Colorado, Longmont Colorado, Loveland Colorado, fort Collins Colorado, Lafayette Colorado, Erie Colorado, and Firestone Colorado. We pride ourselves on providing a wide range of home Cabinet refinishing and kitchen cabinet painting services to our clients that allows you to update and upgrade your kitchen or bathroom without having to Purchase brand new cabinets therefore saving you thousands of dollars and we guarantee a factory finish of any color of your choice. That means that our Kitchen cabinet painting, or cabinet refinishing contractor services are significantly more affordable than full home remodeling, but have the same amazing transformational results. My personalized service and focus on each homeowner’s kitchen and bath cabinets provide long-lasting beauty by refinishing your existing cabinets in durable Urethane based modern colors And we can match to Sherwin Williams or Benjamin Moore colors so that you have plenty of options. We can also drill to add your new hardware to create a customized beautiful look at no additional charge. Refinishing your existing cabinets is the most cost-effective and dramatic change that you can do to create beauty and value. I enjoy helping the Customer understand the complete process by quickly educating them in what are the important questions to ask a vendor, such as what type of materials will you be using on my woodwork? How durable is it? Is it a basic paint or something made specially for fine finish woods such as cabinets? 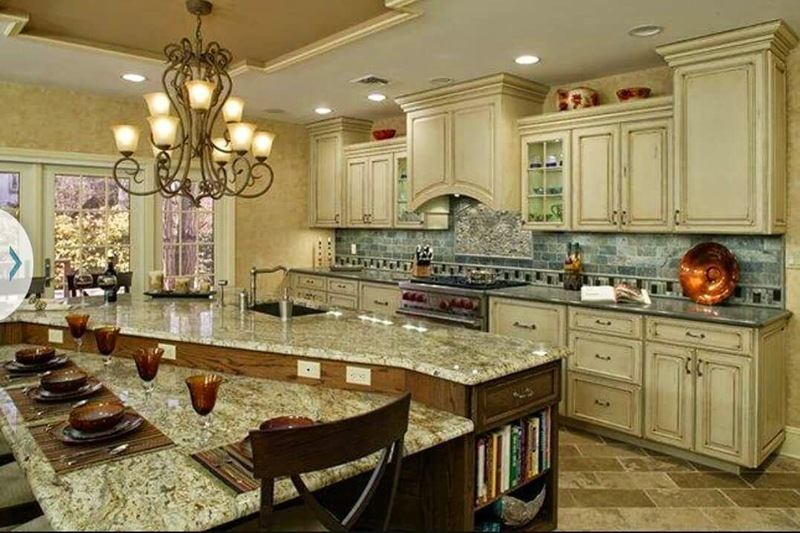 Keep in mind that we go the extra stretch in order to use top quality products for your kitchen about from cabinets. We warn TR work for any peeling or cracking of the paint jobs. The kitchen of your dreams begins with one you already have. Cabinet Refinishing Denver is Denver Colorado leader in cabinet refinishing, cabinet Painting, cabinet staining and cabinet resurfacing. Kitchen Cabinet Refinishing Littleton Co. Whether you are looking to reface your current cabinets, fix your cabinet doors, or install brand new cabinets and apply a fresh new coat of paint, Cabinet Refinishing Denver offers the highest quality craftsmanship and professionalism for cabinet refinishing in Denver. We get the job done right the first time, every time. Don’t waste your time or trust your kitchen cabinets with an inexperienced handyman. Let Cabinet Refinishing Denver transform your kitchen cabinets into the hand finished Look serious factory finish you’ve always wanted. Call us today so we can bring your dreams to life for the kitchen you always wanted. If you would like to get cabinets painting in Denver Colorado, then you have arrived at the perfect site. There are many different types of painters out there. Some are fast, some are cheap, some are sloppy, and some are expensive. The key is to go with a painting company that will deliver the best work at a reasonable price and Always make sure they have great reviews here on Google. Don’t settle for an unproven painter. Cabinet Refinishing Denver cabinet painters will make your project a priority. Each cabinets painting project we take on is treated as if it was our own. Our cabinet Refinishing professional painters will show up on schedule, do work you will be proud of, and complete your project in a timely manner. Our reputation as the best painting company in the Denver area is very important to us. Our goal is to exceed your expectations and become your number one choice of cabinet painters. If you need help with any type of cabinet painting job, just fill out our quick contact form, tell us what you need, and we will get back to you quickly with a quote. Remember the good ole days? When times were simpler and there was no better place to be than at home with the family. Well now it is up to you to preserve that great memory for generations to come. Cabinet Refinishing Denver is the right choice for beautifully capturing the past or putting a modern twist on the days of old. We offer a full line of services, from furniture refinishing or repair to cabinet painting or refinishing, and door refinishing, and we service all of Colorado, including: Highlands Ranch CO, Parker Co, centennial Co, Castle Pines Co, Castle Rock Co, and all of Douglas County, Lakewood CO, Littleton Co., Jefferson County, Broomfield, Thornton, Superior, Louisville co., frederick, Littleton, Arapahoe County, Adams County and all of Denver County, Centennial CO, including Boulder Co, Fort Collins CO, Colorado Springs CO and the entire state of Colorado.. We Will use the best of the best and with all the knowledge and all the wisdom throughout the 35 years of doing cabinet refinishing we have come to the culmination the top of the line products. We Will use an industrial strength water borne acrylics that harden like a lacquer and without the lacquer side effects like yellowing and paint becoming too brittle where it tends to cracks. Does your kitchen remind you every time of the excellent people who sold you who obviously liked a color scheme that is completely different than you do it? Is it true that your kitchen need a look that is practical than a laminate that did the job but does not feel soothing or natural? Would you catch the D.I.Y. bug to renovate your kitchen, only to find out half way through that you’re in over your head? Cabinet Refinishing Denver can help you Refinish your kitchen cabinets and brighten your aging space to enhance your living space and assist you to feel like the kitchen represents the nature you want it to, which means you don’t have to settle for less in your Denver dwelling. Cabinet Refinishing and Cabinet Painting Denver, Also Serves Denver Co. Aurora Co. Parker co. Highlands Ranch co. Boulder co. Castle Rock co. Littleton co. Lakewood co. Castle Pines co. Larkspur co. Colorado Springs co. Fort Collins co. Arapahoe County, Douglas County, Adams County, Jefferson County, Lakewood co. Castle Pines co. Larkspur co.Northglenn Co, Thornton CO, Broomfield CO, Arvada CO, Wheat Ridge Co, Westminister Co, Broomfield CO.